how do we fix capitalism in the wake of enron? WHAT IS THE FIX? for The TUMOR on FACE OF CAPITALISM? The Lesson from the ENRON SYNDROME, the MORTGAGE LOAN FAILURE, the BANKRUPTCY EPIDEMIC, the WALL STREET BANKSTER MELTDOWN and THE TIDAL WAVE OF JOBLESSNESS is obvious. 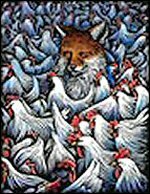 DO NOT LET FOXES RUN THE HENHOUSE! WE THE CITIZENRY must DEMAND our GOVERNMENT Improve the Financial System to Protect Corporations and BANKS (from themselves perhaps,) and protect the economy and the average citizen and investor from THEM! EVERY COUNTRY ON EARTH NEEDS THAT FIX, AND needs it FAST! WHO'S GONNA DO IT? FOXBUSTERS! SOME GOOD NEW LAWS FOR THE FIX that WE MIGHT DEMAND, through OUR POLITICAL ACTION GROUPS, THROUGH OUR ACTIVISM, our Church Basement groups. 1.) GOV AUDITS, TRANSPARENCY, OVERSIGHT!! No publicly traded corp can be allowed to do any maneuvers off the books. IMPARTIAL GOV AUDITORS must look at the smallest tricks. No more Arthur Andersen in on the take, lying like a rug! Full of whiskers just like the foxes he's protecting. 2.) Class Action Law Suits for the investors/consumers robbed by any corp and a legion of pro-bono lawyers (working for minimum salaries only) pushing those suits through. If you bought their stock, their pharm, bought their utilities, you get rebates if they steal, lie, rig, price fix. The Lawsuit will bring the loot back to the People. The URL at top of paragraph refers to Amazonian Indians suing big petroleum corps, a Lulu of a Class Suit! 3.) EXPROPRIATION - The CEO's get fined, the Whole Corp is repo'd & returns to the People who run it with normal salary bureaucrats, college grads, no cronyism. 5.) TO GET through a really KILLER RECESSION the rest of us will need A..)Citizen ACTIVISM to get recently forecloxed on people back on a payment plan with HELP from State gov who didn't regulate Mortgage banks B.) community organization to care for evicted families and C.) Vigilante groups for MOB control. . Imagine a band of hungry homeless boys breaking in at 2 am. You dial the Vigil Org, an alarm goes out over a phone tree and ten MEN WITH RIFLES show up, manacles, rope, and CATCH THE KIDS who hopefully do not have guns. Argentina had a meltdown recently, crime, break-ins and murder for food were endemic. 6.) A New LEAN MANAGEMENT style. Instead of a dozen CEO's and a huge BOARD of DIRECTORS all huffing and puffing and blowing hot air, each draining the corpse with huge salaries, how about some cheap or free guidance from the bottom of the ladder. The subscribers/buyers or clients of any big corporation could easily guide the MANAGEMENT in most policy decisions. I spent hours on the phone yesterday telling EARTHLINK my SERVER of all the things we subscribers loathe about the corporation. They really get us BLUE IN THE FACE angry with some of the nuances of how they interface with us. AOL does a lot of things I consider IDIOTIC, repellent. The customers could easily teach the brass what's USER-FRIENDLY and I'll bet there are a million customers with an opinion who would love to share it. Why not just have one boss? LEAN MANAGEMENT! Save a billion a year right there! Then, get MBA's fresh outta college, pay'em 20k a yr. 7.) On the planetary level, we need a TOWN HALL COMMUNITY feeding info to the CENTER, and also helping each other. Not really like VIGILANTEs, no. More like the weak suddenly have STRONG, LOYAL MALE FRIENDS. You can't get that without a meeting and some bonding. So this community is hopefully ON YOUR BLOCK COMPOSED of FRIENDS, or NEW FRIENDS. Give feasts, garage sales, carnivals often. SECESSION IS A WORST CASE SCENARIO if GOV won't cooperate. MANY STATES may try to become free states to knock free of huge taxation. NEW HAMPSHIRE is attempting that already. If they WIN THEIR FREEDOM, it would serve as an example as what is possible for other states. Reduction of government income/ property taxes, state gasoline taxes and point of purchase taxes would be a good start to leaving people with the cash for food, rent, tuition. HOW CAN WE FIX IT??? COMMUNITY UNITY! politicians. Comb them out of our hair like LICE and get volunteers. We need to lose the CEOS and get volunteers to shepherd business, people with MBA's. ever --when we run the system. Standards have fallen in more ways than one. Let's pick the fallen banners up and fight the good fight and never be like them. MICRO-LENDING TO ENTREPRENEURS. (click on url) Anyone who wants to create a business should get micro loans. They can do it in PAKISTAN, Africa and DO. Muhammad Yunus just won the NOBEL PRIZE for lending to extremely poor people, folks living in HUTS. Why not here? RENT A CEO - Click on URL. No more Mr. Hand-In-the-Till. Let's get pureminded, non material girls fresh outta college with MBA's or old, relaxed, retired CEOS and pay them 100k a yr, perks only if Corp gets very vigorous, healthy and profitable. If not, some entry level salary like 50k per annum. LAST POSSIBILITY? SMALL IS BEAUTIFUL. We may be able to MICROMANAGE somewhat by SECEDING FROM THE UNION. Is state gov less corrupt? DO WE need WASHINGTON DC? do we need banks out of NEW YORK? It's not MY WALL STREET! Let's use our credit unions for banking. Recently, CNBC news interrupted Mr. Greenspan's testimony to broadcast the Enron hearing instead. The Enron collapse received so much attention not because it is the largest corporation bankruptcy by sheer number in the history but because of the complicated relationship it involves and its implications. A criminal investigation into the events surrounding the bankruptcy was already on the road since last week. With digging into the affair, all the facts will be clear to the public. The Enron collapse is devastating for a large number of investors, employees and pensioners. The public is suggested by financial advisors to "diversify, diversify, and diversify." However, if a company held in such high esteem like Enron can go under, who is safe? If many companies go bankruptcy, how could diversity work? The solution, therefore, lies in a good financial system to prevent such kind of collapse. With current available information, I found what happened to Enron is surprisingly similar to what happened to some Asian companies during the 1997 financial crisis. White House spokesman, Ari Fleischer, argued that Enron's collapse was a corporate scandal, not a political one. However, this corporate scandal suggests that some problems that caused many Asian corporate bankruptcies during the 1997 Asian financial crisis may also exist in the U.S. financial system. To protect investors, the fundamental issue here is to fix these problems. Enron was a Houston-based natural gas and energy company. It delivers commodities and financial and risk management services worldwide. (Day their boy W won election, they double price in CAILF to all utility subscribers, at the pump, the SOB's. ) In late 1999, the company launched EnronOnline, the world's biggest web-based transaction system, trading everything from weather derivatives to coal. This helped Enron realize its image of transforming from a traditional pipeline company to a dotcom. Enron's CEO Mr. Lay was quoted in 2000 as saying "We're an energy and broadband company that also does a lot of other stuff." Actually, the management efficiency is impaired by the spectrum of its business. Enron invested $1.1 b in broadband business over two years but made no money. Similarly, large conglomerates are common in Asia and take an important role in the economy. For instance, Daewoo, a Korean auto manufacturer, also invested in many industries such as restaurants, textile, and cloth. Their complexity makes even themselves hard to clarify all the business at all. Second, they have a close tie with the government. In Asia, these companies are often controlled by people who have close relation with top government officials. The connection of Enron to Mr. Bush is known publicly. Enron and its executives donated $114,000 to Bush's presidential campaign. This connection dates back to Bush's time as Texas governor, when Mr. Lay was head of governor's business council. Since the 1989-90 election cycle, Enron has made nearly $ 5.8m in campaign contributions. What drove these conglomerates grow is a bull market. According to an article at Financial Times on January 23, 2002, Enron's investor relations and culture- even its business model- were ideally suited to the confidence and ready money that pervaded Wall Street in the 1990s. Enron used the money it can collect to expand aggressively. During the 90s, some Asian countries are called tigers for their fast growth. People are optimistic about these nations. Much money from western countries and from domestic individual investor is ready to flow in financial market. Their targets are large companies in the area that has privileges such as telecommunications and transportation. In addition to a bull market, the undeveloped capital market in Asia helped these companies collect money or boost their stock prices. There is not enough transparency for investors to know the business clearly. They often counted on the close tie with the government that will benefit these companies and bail them out of any trouble. Incredibly, the similar thing happened to Enron in the U.S. market. Enron's accounts are impenetrable. It is secretive; it has off balance-sheet vehicles; it was opportunistic to the point of aggression. "The analysts were not analyzing, they were believing." says Mark Roberts, director of research at a consulting firm Off Wall Street. Analysts, who were paid to follow the sector, proceeded to issue the next "buy" recommendation even when they fail to understand Enron's books. Investors expect the management's ties to Bush administration to yield indirect dividends, such as furthering the deregulation that had enabled its business to boom. Obviously, Enron took advantage of this opacity and finally it became the victim of this opacity. Anderson's role as Enron's auditor had already come under focus as Enron spiraled towards collapse. Enron has admitted overstating profits by nearly $600m and has made a $1.2bn write down to end off-balance sheet transactions with a fund set up by its chief financial officer. The failure of Anderson to really look behind these issues and raise fundamental questions is unbelievable. The documents shredding shows the potential conspiracy between the chief executives of Enron and Anderson. Anderson has become the spotlight of the current hearing in the Congress. Its behavior may violate the current law. Yet some of them are legal but not proper to serve as the goal to protect investors. The current accounting system has become one "that delivers volumes of complex information about what happened in the past, but leaves some investors with limited understanding of what's happening at the present." Also, in 2000, Anderson earned $25m for audit fees from Enron and another $27m for consulting fees. The question is whether this enormous consultancy fees affect the rigor of its audit. The idea of splitting off consulting businesses from audit firms may be reconsidered. The accounting changes required are obvious. But change must go beyond the scope of the financial implosion. Cronyism is criticized by some scholars to be the reason of the 1997 Asian financial crisis and seems unique to Asia. No economic policy can be made for efficiency goal alone. The U.S. is no exception. Politics and economic policymaking involve money and lobbying. Therefore, a balanced information disclosure mechanism in financial system is necessary to balance the effects of lobbying and the efficiency of policy-making. Only this way can entail business to operate healthily. Cuz DC made our WORLD TOAST! Our East COAST the Mississippi, every twisted bend. Unless a contractor has some extra TAR. No usury in banks, NO interest points allowed. Westerners are a simple, very frugal crowd. Folks who wanna join us, are welcome to come west. Westward Expansion for the sore numb guest..
At finding the east coast got us THIS into hock.! By then, our farms will overflow with food. happy families, dozen in each brood. Grapes on every vine, Deep water 'neath each boat. We'll stop 'em at the border. Don't like crooks very much. We don't want their inventions! Gold Parachutes & derivatives not allowed! that tacky analyst/ broker crowd. No betting on an outcome. No gambling should exist ! In fact please take Las Vegas. Work and Paycheck keep us blissed. Make your choice and you'll be freed!